Coatigan = a coat shaped, cardy, not woolly, like a coat but, not a coat...Clear?! Good! I spotted this on ASOS last week and thanks to a next day delivery, have lived in it for the last couple of days! It's not lined or particularly warm (who cares when you're shopping) but, it's perfect (and got a lot of love at the shops today)!! 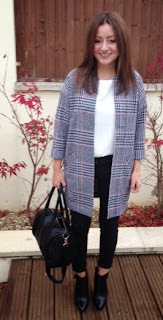 I went for 2 sizes smaller than I am and I'm really pleased with it and because it's not a heavy wool structured coat, it sits well and moves with me. Coatigan - ASOS, see all here. Leather pants - Miss Selfridge recently but, not online. Heels - Rupert Sanderson. Jeans - Old ones from River Island. Bag - Portman, a few months ago and no longer online. Top - A plain cream Topshop number that is also not online. Boots - New from Aldo and on their maiden voyage today, buy here. The sole reason; Warehouse had moved to a new store and had an incredible upgrade!! Not only that, they were hosting a whole day of make overs, giveaways and free fashion illustrations...The store was buzzing, gorgeous girls were out front handing out crackers, all loaded with prizes and discounts off your purchases!! It's already up in my wardrobe... I LOVE IT!!! Jacqueline - creating my illustration..
Post illustration/changing room shot buying the belt (with the 15% discount I won) to go with the coatigan. Buy the belt here. A massive THANKS to Warehouse for the discount, illustration and make over - what a way to spend a Saturday!! Thoughts on the coatigan? How would you wear it? Are you struggling with the boyf coat cut? You should have a look at petite ones, ASOS have loads on the link within this post. That illustration is fab too!